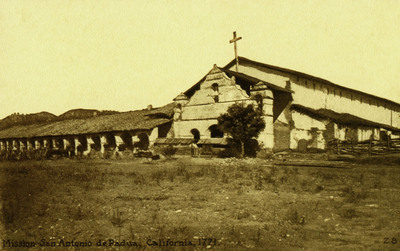 "California – Mission San Antonio de Padua, California, 1771"
Mission San Antonio de Padua, California-1771. San Antonio is the third missions in the order of founding and its location in the heart of the mountains, overlooking the most beautiful of valleys, is ideal. It is in a reasonable state of preservation to-day, but within the ruined Church, all is still and deserted now. One black and white postcard with a divided back. The postcard was published by The. O. Newman Company in Los Angeles & San Francisco, California.